Supernatural becomes a detective noir style mob thriller as Sam and Dean hunt for the ingredients of their spell to take them to the other world. Over the years this show has delivered many different types of episodes. Many of these changes in format have been a lot of fun but unfortunately this isn’t the case here. MacGuffin hunt plots are often problematic in television because it’s very easy to create disposable filler episode surrounding the search for them and that’s pretty much what happens here. Sam and Dean are on the lookout for the blood of a most Holy Man as the first ingredient in their spell to open a portal to the other world and the first step on their search is to visit a dealer of religious artefacts named Margaret Astor (Leanne Lapp). She immediately takes a liking to Sam so indulges their questions and points them in the direction of another dealer named Richard Greenstreet (Dominic Burgess) who reportedly has access to the blood of a Saint on the assumption that procuring that will count as the blood of a most Holy Man. The individual scenes featuring these characters are entertaining enough. 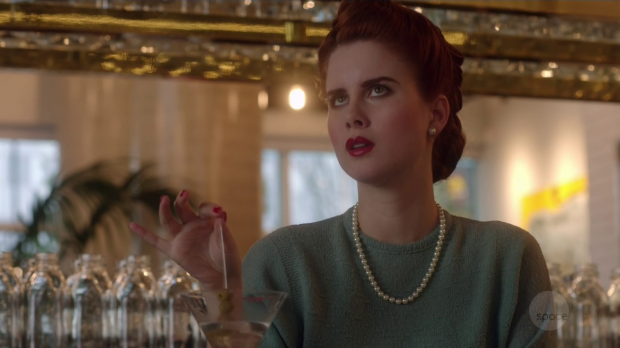 Leanne Lapp in particular makes an impression as expected after her strong work in iZombie and Dominic Burgess does a good job playing the arrogant yet disgusting rich guy but the scenes only exist to send Sam and Dean on their way to the next stop in their journey. From here Sam and Dean are embroiled in a mob story where various parties are fighting over who takes illegal ownership of the skull of a Saint. With all the interest in it you’d think it would have magical powers but it doesn’t seem to. As far as the episode is concerned it’s just a run of the mill skull which makes me wonder why everyone was interested in it. This episode is essentially a selection of busy work for Sam and Dean who try to figure out a way to navigate this bizarre situation that is far outside their comfort zone. There is entertainment value in Dean completely burying himself in the part and treating it as if he’s in some kind of Mobster movie but that’s all it really amounts to. The plot itself isn’t all that interesting nor does it ever feel like it has any real sense of momentum. Most of the scenes feel like padding and this type of storytelling really doesn’t suit Supernatural which is something I never thought I would say. 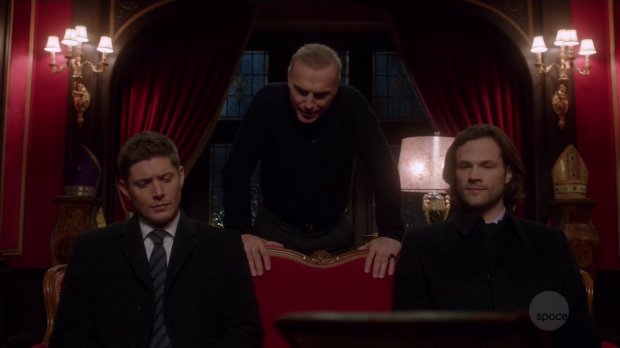 Father Camilleri (Massi Furlan) was the highlight of the episode as he made for a really interesting character who made Sam and Dean think about the meaning behind their actions. He talks very practically about morality and how that pertains to the world around them by pointing out that there is a lot of bad out there and it will never be perfect but that’s no excuse for good men to not try to make it a better place. Any effort to improve things is significant because if good people continue to do what they can to make the world a better place then there will always be hope. His words deeply resonate with Sam who refuses to let the Mobsters win this time because there are too many examples of terrible people getting what they want and he’s sick of it so he decides to champion the good guys. I really liked the approach to Father Camilleri as a character. His presence makes the episode slightly rise above being completely disposable filler. Religion is often mocked and dismissed in fiction for being misguided but that’s not the approach here. This show uses the Bible as source material so religion is ultimately part of its DNA which makes it interesting when religious characters show up who aren’t aware of the truth of the situation. Father Camilleri has absolute faith in God which helps give him the strength to continue. His conversation with Dean is particularly interesting because Dean knows God really well so knows not to expect divine intervention which is what he assumes Father Camilleri is talking about when he says that God will see them through. What he’s actually talking about is God in a broader more existential sense. He doesn’t expect God to directly intervene but he sees all good things in the world as being attributed to God in some way. Sam is doing a good thing and, as we already know, Father Camilleri believes that any goodness is worthwhile so has faith that Sam’s actions will yield a positive result. It’s refreshing to see a religious figure in a TV show with a unique outlook and practical reasons for their faith. It’s no surprise that he turns out to be the most Holy Man who supplies the much needed blood. Father Camilleri’s lessons really resonate with Sam who talks to Dean about their lives in general and wonders if they are actually making the world a better place. No matter what they do there’s always more to deal with and Sam wonders if there will ever be an end point to what they do or if it will just continue as long as they live. It’s almost a meta commentary on the show itself as it gets renewed year after year with no end in sight. When do Sam and Dean say that enough is enough and decide that there’s nothing more they can really do to make the world a better place? 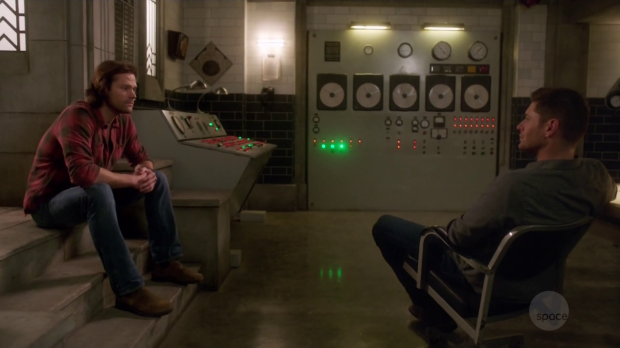 It’s certainly something that’s going through Sam’s head and discussing the subject clearly makes Dean think as well. Curiously the tablet that is supposed to banish all Demons and associated supernatural problems isn’t mentioned but the spirit of what Sam’s saying is really impactful. This season has seen both brothers lose hope at different points because of all they have lost and Sam’s musings on whether it will ever be over suggests a collective weariness starting to set in. Whether this will continue to inform Sam and Dean’s outlook over the rest of the season remains to be seen but addressing it after having their world view challenged is at least interesting for this episode. An underwhelming episode with an uninteresting MacGuffin hunt plot that comes across as almost entirely disposable. there are entertaining moments here and there but on the whole it feels very laboured as a viewing experience. The plot amounts to little more than receiving information before moving onto the next thing without much depth to it. The exception to this is Father Camilleri who makes for a refreshing take on a religious character. His thoughts on about good people doing the right thing whether they feel that it makes a huge difference or not are interesting and the way he inspires Sam to fulfil his obiligation to general goodness works really well. His approach to God is very practical and sensible as well. Sam’s conversation with Dean at the end of the episode about whether their job will ever be over suggests a weariness to both of them that comes with constantly dealing with world ending threats without any real indication that any sort of difference is being made. All of this elevates a really dull outing.